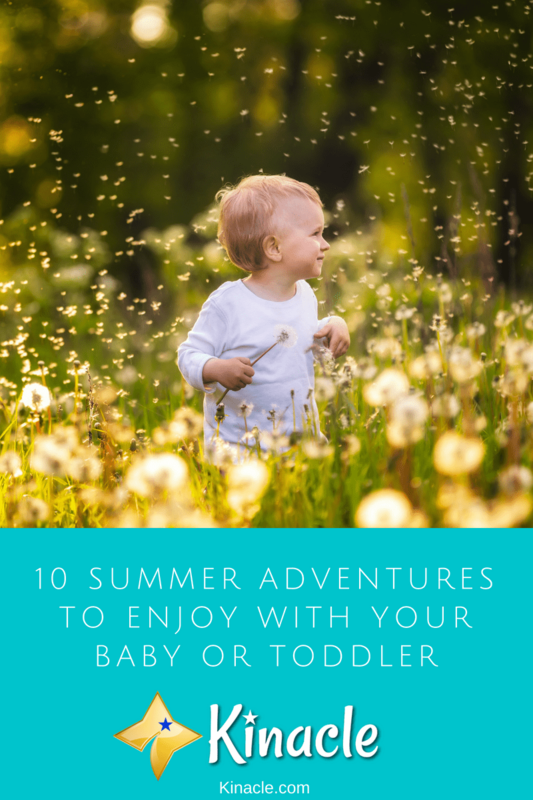 If you’re at a loss as to what to do with your baby or toddler this summer, here you’ll discover 10 summer adventures you’ll definitely want to consider. This is a great summer adventure idea for both babies and toddlers. What could be more magical than taking baby to the beach for the first time? It’s a great, budget-friendly option which enables you to enjoy the summer weather as a family. Don’t forget to take plenty of snacks and refreshments, along with a sun umbrella and some toys for your little one to play with. Another great tip is to use a jogging stroller if you have one. These tend to handle the sand much better than standard strollers. While the beach is definitely a great summer adventure idea, make sure you don’t spend too much time there; especially during peak hours. Babies and toddlers can easily get bored and there’s also a chance they could burn if you don’t keep reapplying sun lotion. If you’re taking baby to the beach, it’s also important to keep an eye on them around the sand. Babies are renowned for trying to eat everything in sight, including sand! You don’t need to leave your home to enjoy a summer adventure with the family. You can host one right from your very own back yard! A backyard movie night is an awesome idea. You can either watch a movie as a family, or you can invite your toddler’s friends around to watch it with them. You’ll need a screen that the movie can be projected onto. You can either buy one or create your own. You’re also going to need seats (which could be something as simple as a blanket), snacks, refreshments and a maybe even a few signs advertising the movie night and the particular movie that’s going to be playing. It can be daunting taking a baby or toddler camping, but when planned correctly, it can also be super-fun. Camping is the ultimate adventure, so you can be sure your toddler is going to love it. It’s also a great budget-friendly activity which allows you to get out of the house and immerse yourself in nature. While you will want to take some toys for your little one to play with, you’ll find they are more than happy to make use of what nature has provided. Pine cones, sticks and leaves are all fun items they’ll be happy to play with for hours on end! Camping is great for babies and toddlers as the fresh air will really help them to sleep. A few tips to follow if you do plan on heading camping this summer, include taking a carrier for baby. You’ll be able to place them into the carrier attached to your body and carry them around safely when you go exploring. A portable play yard is also a great idea as this will help safely confine your baby or toddler while you cook. If you’re looking for a day out that’s guaranteed to keep your little one happy, a trip to the zoo is definitely recommended. While some babies may be too young to understand what they are seeing, they’ll still be fascinate by the strange animals they get to see. Toddlers will love a trip to the zoo and it will also give them plenty to talk about for the next week or so! If you don’t have the money to visit the zoo, you could always consider a trip to a local farm. Some farms allow children to visit absolutely free. So, take a look at what farm attractions are situated within your local area. You don’t have to go camping to enjoy the wonders of nature. Getting out to your local park or woodland is a great way to enjoy nature without having to sleep in it. If you head to a park, why not research and come up with a few games you can play while you’re there? Or, if you’re heading into woodland, you could create a little list of things your toddler is likely to see and give them the task of finding them. Exploration is important for toddlers and it is what summer adventures are made of. Best of all – it’s absolutely free! A picnic can be a fun, affordable summer adventure. As the weather is beautiful outdoors, what better way to enjoy it than with a nice light picnic? This is an especially great idea for toddlers as not only will they love being outdoors, but the finger foods will also help to keep them happy and distracted while you’re out. You can have a picnic practically anywhere from the beach to your local park, or even the backyard. Why not aim to have several picnics over the holidays, each time heading off somewhere new? When the weather is particularly hot, heading to your local pool can be a great way to cool down. Outdoor pools are a good option, but they can get packed during the summer months. Therefore, you may want to check out whether there’s any baby and toddler classes at your local indoor pool which could be better suited. They’re likely to be much quieter and when you’re swimming indoors, you won’t need to keep worrying about reapplying sun lotion. Another one for the toddlers, bug hunts can be great fun! You don’t really need much in the way of equipment, but a magnifying glass and a container would prove useful. If you can stomach it, you can help your toddler find and collect the bugs as you explore the great outdoors. Again, this is an activity which can be done anywhere from the back yard to local woodland and parks. You could even make it more educational by printing off information about the bugs you’re likely to find. You can then teach your toddler about the different bugs as you find them. This idea is a little more unique and largely suitable for toddlers. Toddlers, especially boys, love fire engines. So, what better adventure to go on than to your local fire department. Now, it’s important to call the fire department ahead of time to ensure they do allow visits. You should never just turn up! You’ll find a lot of firefighters are more than happy to give toddlers and young children a tour of the station. They’ll also likely let your toddler sit in the fire engine. So, if you really want to make their day, arrange a trip to your local fire department. Finally, when it comes to adventures, you can’t beat hiking. You get to see so many different things when you head off on a hiking trail. Whether you’re heading out with a baby or toddler, hiking is a great way to enjoy summer and get out of the house. Make sure you research toddler-friendly hiking trails and account for taking a stroller with you. Not only is hiking enjoyable, but it’s also going to keep you fit too! These are just 10 great summer adventures you’ll want to consider trying. With so many great things to do, there’s no reason you should feel confined to the home this summer. Go ahead, give some of the above ideas a try and let us know how you got on in the comments below.